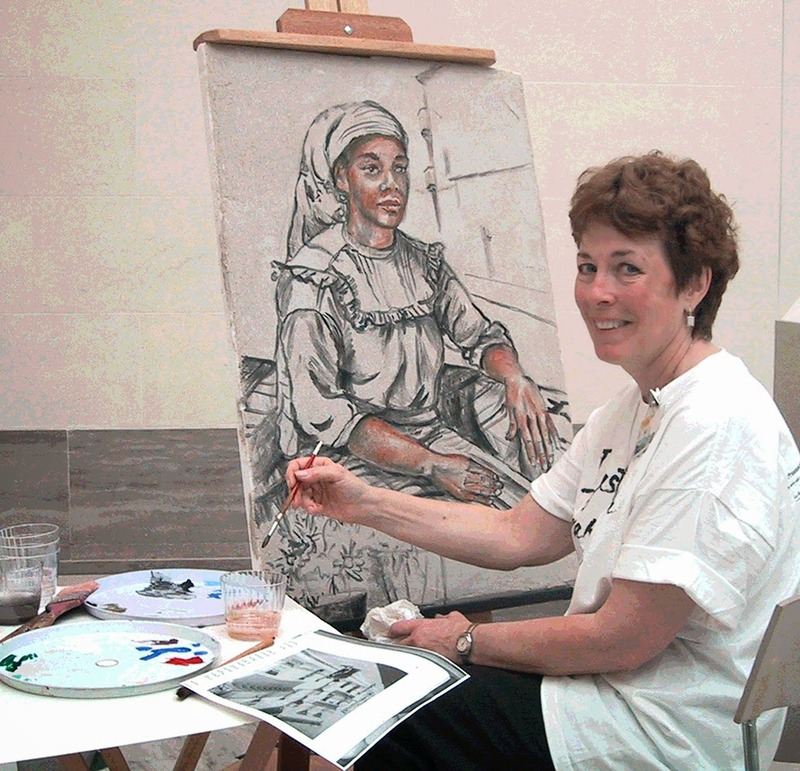 In 2003, I was part of a fresco painting team doing a demo at the SF Legion of Honor Museum. We had a model sit for a portrait done in true fresco. My teacher, Jose Gallindo, was able to speak passionately about his work in this ancient medium and generate excitement around this media that was made famous by Diego Rivera and Frieda Kahlo. I am working from a live model who was dressed in Mexican style on a larger portable panel and have the black outline drawn in pure pigment and I am getting ready to mix color directly onto the smooth wet lime plaster that will dry to a bright white. The colors deepen in a short time and become permanent. I love the way a brush flows onto this porous surface. Although it can be challenging to draw and paint out in the open museum, it all worked so nicely, I was able to stay focused and the ambient of the marble lined gallery added to the experience. It was my choice as to what to do in the background, so I am getting ready to draw in a street with a house that is based on Frieda's home in Mexico City, which is where Jose lives today.